Summary: In an alternative world, a being named BETA from mars started attacking human and eventually invading earth since 1976. The story is about some pilot training school for the mechas that is used to defend earth against BETAs. Personal comments: Um...it feels somehow just like IS: Infinite Stratos, except there's a reason for these girls to pilot these mecha. But unlike IS, Muv-Luv here doesn't really bother to explain why there're only girls in this school. 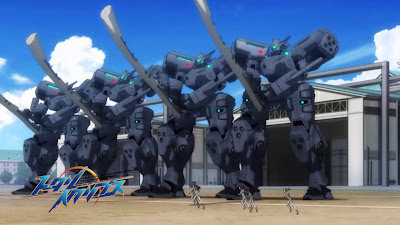 As for mecha battle goes, it has the exact same pitfall I consider all mecha animes have: during mecha battle, it is as if the strength of the pilot actually matters--somehow screaming louder and pushing harder on the levers could make the mecha push harder. It's such a stupid concept that I can't believe all the mecha fans out there just completely ignoring. Can any mecha fans out there how you find this logical? My problem with mecha animes is the fact that screaming harder and pushing harder on the lever actually DO make the mecha strong and push harder, like when a mecha is previously pinned or not able to lift something, somehow when the pilot screams or gets a adrenaline rush, its mecha somehow manage to get more pushing/lifting power that previously thought to be already at its limit and unpin itself or lift something it wasn't able to lift. That's just one of the silliest things in mecha anime and the logical inconsistency of such scenario just always bothered me while watching mecha anime. picture this; its like the pilots are linked physically and mentally, but I do agree with you on the lever part. the point I think they are making is that the characters have a hidden power or strength to keep fighting. Emotions can effect how the mecha works-looking back at the animes Aquarion Evol and Gurren Lagan- either by giving power or losing power, its as if the mecha itself is alive-looking at Eureka 7 this time- so ya that's all I got to say. For animes that DO employee the concept (FMP, Broken Blade, AE, etc. ), yes, it makes sense. However, almost every single mecha anime out there that DOESN'T use the pilot/mecha linkage concept does the same damn thing. That in my opinion is just STUUUPID, and that's what I'm referring to.